Following the sold-out opening for Bickford Summer Jazzfest, the party continues with three more great concerts on July 20, July 24 and August 3. The hot swinging jazz will be combined with the area’s best Food Trucks on-site for tailgate picnics before each concert. TICKETS: range from $17 to $25. Tickets may be purchased online at morrismuseum.org, by phone at (973) 971-3706, or in person at the Bickford Theatre Box Office. The Morris Museum’s Bickford Theatre is located at 6 Normandy Heights Road in Morristown, NJ, and offers free parking and full accessibility. Box office hours for phone sales are Monday through Friday, 10:00 am to 5:00 pm. Walk-up hours are Tuesday through Friday, 11:00 am to 5:00 pm. The always-popular Full Count Big Band takes the spotlight, celebrating singers who headlined on the Strip. The talented vocalist Joe Ferrara will front the big band as they swing their way through songs made famous by Frank Sinatra, Tom Jones, Sammy Davis Jr., Elvis Presley, Tony Bennett, Bobby Darin, Louis Prima, Buddy Greco and Dean Martin. With an approach that incorporates many different influences, Joe Ferrara is not only a great big band singer, but also a talented performer who has worked with the likes of Manhattan Swing, Lou Pallo, and the Red Bank Jazz Orchestra. The 17-piece Full Count Big Band has been entertaining metropolitan New York/New Jersey audiences for more than a decade. Before the concert, everyone can enjoy a tailgate picnic with the acclaimed Dark Side of the Moo, Yummy Food Truck, and Cupcake Carnivale. Cupcake Carnivale is consistently rated as one of the top food trucks in the whole country and Zagat’s put them on the list of Top Ten Food Trucks You Must Try in the whole country. Singer, composer and trumpet player Bria Skonberg comes in with her Quintet. She has been called “the shining hope of hot jazz” for good reason. She is one of the most exciting young stars on the jazz scene today and is scooping up awards, critical acclaim and fan accolades for both recordings and performances. She is the 2017 JUNO winner for Vocal Jazz Album of the Year and was recognized last year by DownBeat Magazine as one of “25 for the Future.” Some of her other recent awards include Best Vocal and Best Trumpet Awards from Hot House Jazz Magazine, Outstanding Jazz Artist at the New York Bistro Awards and a DownBeat Rising Star Award. She and her group will feature tunes from her just released “With a Twist” CD as well as popular favorites from her vast repertoire. 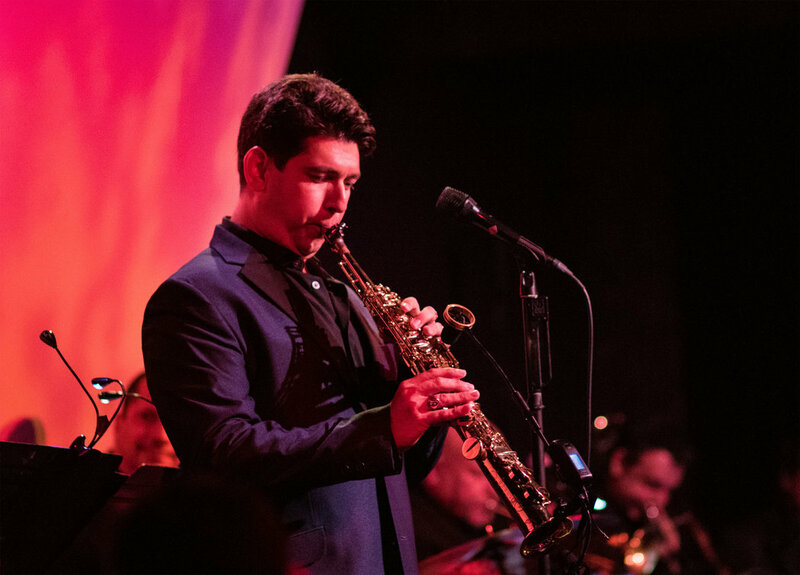 Bickford Summer Jazzfest will conclude with Danny Bacher & Friends featuring a new young talent on the swing jazz scene, sax player and vocalist Danny Bacher. His extensive theater experience has made him an engaging stage presence where he mixes his silky smooth singing with hot jazz saxophone and comedic storytelling. Danny brings with him an equally talented group of musicians including drummer Mark McLean, pianist Alan Farnham, bassist Dean Johnson, and saxophonist Charlie Caranicas who also plays with the great Vince Giordano and the Nighthawks. Before each concert, the Bickford Theatre will have food trucks on-site from 5:00 to 7:30 so concert patrons can enjoy a tailgating picnic prior to the music. The food trucks will also be open to the general public so everyone is invited to the picnic.